1500-1800 in the Community School grounds: Huw & Sheena's Radio Sanday Roadshow, incorporating Rock the Bikeshed (if fine weather) or Hullabaloo in the Hall (if not). Musical requests & live music spots. Do send in your musical request, and state which hour in which you'd like to hear it. If you have a message to send to your loved one, it'll make the Show more fun - but remember that we aim to match the high broadcasting standard of Radio Orkney. Meals at hostelries - maybe informal music sessions?? 1430 in the Community Hall: Orkney Camerata in Concert, with guest appearances from Sanday Fiddle Club and from Sanday School Choir. 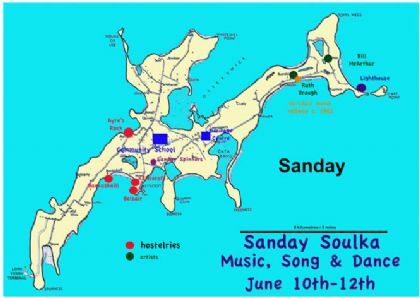 The Concert will include Sanday music by Max: Backaskaill March, Cross Kirk, Start Point, Graveshill as well as some of the 'Songs of Sanday' first performed by the School in 1998. 1600-1700 Cheese and wine Social in the Community Room, during which the prize-winning raffle tickets from the grand June weekend Soulka raffle will be drawn.